Definitely a highlight, the unChristian session in the evening was almost as good as the book itself. 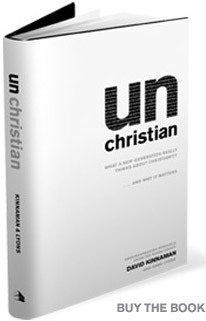 I had purchased unChristian before the conference and had worked my way through a major part of it. During Q this past Spring we had heard about the book and had been able to hear from David Kinnaman. The research is great and the insights are eye-opening to say the least. This entry was posted on October 7, 2007 at 2:27 pm and is filed under catalyst labs. You can subscribe via RSS 2.0 feed to this post's comments. You can comment below, or link to this permanent URL from your own site.